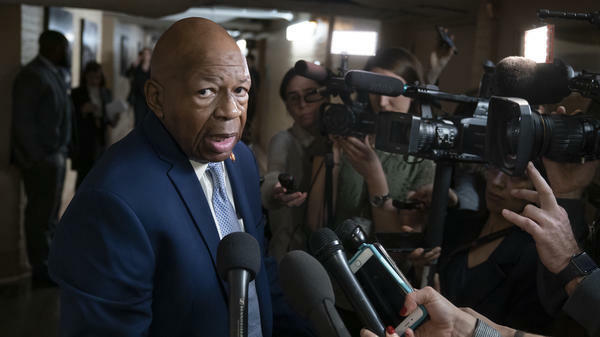 House Oversight Committee Chairman Elijah Cummings talks with reporters at the capital. The Maryland Democrat has launched an investigation into the White House security clearance process. The committee wants "to determine why the White House and transition team appear to have disregarded established procedures for safeguarding classified information" and "evaluate the extent to which the nation's most highly guarded secrets were provided to officials who should not have had access to them," Cummings wrote. The White House has not adequately explained why former national security adviser Michael Flynn did not have his security clearance revoked after officials learned about his conversations with the Russian ambassador, Cummings said. Flynn has since pleaded guilty to lying to the FBI and is currently awaiting sentencing. Prosecutors have described him as a model cooperator. Cummings named a number of other Trump administration officials, including Jared Kushner, the president's son-in-law and adviser, who reportedly neglected to properly disclose meetings with foreign officials as part of his security clearance application. Kushner temporarily lost his top secret clearance last year but ultimately regained it after a marathon meeting with Justice Department officials. The committee is also interested in former White House aide Rob Porter, who left the White House in 2018 after allegations that he had abused two ex-wives. He has denied those allegations. The committee wants to understand the process behind Porter's background check and why the abuse allegations didn't come to light sooner. "For the past two years, I have sought information with other committee members about a series of extremely troubling incidents regarding the security clearances of some of President Trump's top aides, but the White House has refused to provide the information we requested, often ignoring our requests completely," Cummings said in his letter. Trump and his allies have said they are wary about what they have called a program of "presidential harassment" from congressional Democrats under the guise of oversight and investigation. Bradley Moss, an attorney specializing in security clearance issues who is not involved with the committee's efforts, said that what will be critical is establishing whether proper protocols were followed and analyzed by the correct government officials. "It is important to reassure the public, especially when we are talking about top officials like Michael Flynn and Jared Kushner, that experienced adjudicators, not political players, were making these important security decisions," he said. Cummings is not just interested in documents from the White House for this security clearance investigation. The oversight committee is specifically interested in Trump's current national security adviser, John Bolton, and his onetime participation in a Russian gun rights campaign. Bolton recorded a video in 2013 for The Right To Bear Arms, a Russian gun rights group then run by Maria Butina, the Russian woman who has admitted serving as a clandestine agent for Russia. NPR has previously reported that Bolton was asked to do the video by a former president of the National Rifle Association. Cummings asked the NRA in a letter Wednesday to provide any documents related to Bolton's foreign contacts. Information received from the NRA could be checked against Bolton's security clearance paperwork for consistency regarding foreign contacts he may have had. Cummings also asked for more information about the NRA's subcommittee on international affairs, a largely opaque group that Bolton was appointed to head in 2011. The committee told the NRA that it expected a response by Feb. 6. The NRA has not responded to a request for comment.